Those first train rides to Brooklyn were salvation compared to those creep-zones linking Hollywood and Vine and along Sunset Boulevard. Brooklyn was all about families –Jews and the Italians. Hollywood –predators and chicken-hawks. I loved the noise, the hugs and being called “Billy”. I also loved the respect bestowed on musicians in New York of the 60s. Coming from a large family with Italian roots, I understood the calming sensation of being surrounded by loving women on my mother’s side- pots of steaming pasta, shelves filled with cakes and pies, ham so salty you’d have to pause and cleanse the palate to savor the next plate. Nobody spoke in time - everyone interjected to a broken beat. Conversation was a boxing match; the victor – the last word. Traveling coast to coast across America, I logged some serious mileage. Not that of a rock star gobbling pavement to the next gig, but just a guy making his way from point a to point b, c, and d. I never felt a bond with the west other than scenery. Cacti are a lovely sight from a distance but a thousand of miles of prickly needles extending as far as the distant horizon could never compete with four-stories of aging brick tenements - the sound of street traffic and haggling vendors. This was when I felt most alive. Backside a cash register on 8th Avenue in lower Manhattan was a musician advert – “looking for a Hammond B-3 player – plenty of R&B work up and down the Atlantic coast – call Vic.” Each week I’d drop in the record center and sort through new titles. On one such occasion I’m thumbing through the jazz section and pull out a side with vibraphonist Gary Burton and a guy standing next to me says, “don’t buy that one, this one’s better, Lofty Fake Anagram, he says.” He then introduces himself as Al Kooper and goes on telling me which Gary Burton sides impress him. At least he had an opinion! With only a weekend gig playing solo piano at Louie Jordan’s downstairs next to the Bitter End Café to occasionally rely on, I dialed the number from the cash register. The next year or so was a baptism in East coast rhythm & blue; Italy, American style - big humor and doo-wop. Up and down the coast, crazy gigs, a weeklong, sometimes two, back of a van. This flashback comes courtesy of a Facebook video post by Johnny Scupelliti (Johnny Doo Wop from the Reactions). Johnny sings with my old Brooklyn bandmate – Vic Bonnadonna – stage name, Vic Donna. Vic was a local teen sensation following on the heels of Frankie Avalon and other boy-toys of the era. Good looks, wavy hair, big smile and easy-going. Vic was signed by Atlas Records and paired with popular Harlem doo-wop group the Parakeets and went on to record two sides with the group as Vic Donna and the Parakeets. These days those singles are a collector’s find; the big score. When Vic and I hooked up he’d finished his days with the Compliments, another doo-wop unit. That video I’m talking about has 133,000 plus Facebook views, 2465 shares and is from December 2015 at the Brooklyn Doo-Wop Club. Men now in their mid-seventies gather and sing their old hits, those of a generation who hung out on street corners and harmonized acapella. Doo-wop is a music born on the street corners in African-American communities of New York City, Detroit, Cincinnati, Philadelphia, Chicago, Baltimore, Washington, D.C. and Los Angeles in the 1940s. Big popularity arrived in the 1950s and early 1960. The first recording to use the words “doo-wop” was in the 1955 hit, “When You Dance” by the Turbans. Late fifties, the Italians got on board and became significant partners in the rise of the music’s popularity. There have been various revivals over the decades but as I write, only a small pocket of engaged folks still follow the singers and music. Vic, Johnny and crew move from place to place and set up monthly doo-wop celebrations and still sing with great skill and passion. I found Vic’s telephone number and here’s his story. Bill King: What is the Brooklyn Doo-Wop Club all about? Vic Donna: It’s not there anymore but there’s another one in New Jersey where I live. It’s a club where all the guys who used to hang out and sing on the street corners in the 50s - anybody who may have recorded with one of the doo-wop groups of the time like myself, even those who came out of the woodwork and wanted to be a singer. We go to different corners. Some even go into rest rooms for the echo like we did when we were teenagers. There’s a place here now that’s a restaurant everybody goes to with a disc jockey, sound-system and open mike; kind of a thing if you have a group and anything that has to do with the fifties. They remember me from the two records I made back in 1957 with the Parakeets. It’s my claim to fame over there. I didn’t even know about this until I moved back from Las Vegas. Out west there was nothing, but here, people still loved the sound. There were a couple groups working in Vegas and I was in one. Our group was put into the Las Vegas Museum of Music Hall of Fame. Vic: You used to make fun of the name. Bill: I would still do that! That was the thing at the time – the “bird groups’ The Swallows, The Ravens, The Orioles, The Penguins, The Crows, The Flamingos, The Blue Jays and The Larks – the others were drawn from cars. Vic: They sang like birds. It was on the Atlas label - a small label from Harlem. It was an all black label and I was the only white guy on the label. When I came back people would walk up to me and ask, “are you the Vic Donna who made those records in the 50s?” Somebody had spread the word. Not long after, people started asking me to be in groups. I worked for a while then formed the new edition of the Vic Donna group. In Brooklyn, there was an old record shop called Rhythm Records that sold rare antique records from the 50s. All of the guys who sang that music or were familiar with that music used to hang out there. They’d even hang around and sing in the shop. That’s how that Brooklyn Club got started. The record shop closed and we had nowhere else to go. A friend of mine got a hold of this place in the marina which had a bar, the one you see in video, and they let us use the place once a month to go and sing. Eventually, that closed to so now we do it in New Jersey. There are a lot of on-line radio stations keeping the music alive. There are shows still coming from campus stations like Rutgers. Once a week they have an hour or two of doo-wop music. I’ve been doing a lot of interviews lately. From my background and what I know and the quality of my group, we are now one of the best-surviving groups around and have built a nice following. Bill: Brooklyn of your youth? V.D: It’s pretty much like it’s portrayed in movies. On the street where I lived there were a couple recording groups that had hit records in the 50s. They were my mentors. One time we did the Ted Steele Show. He had a show much like American Bandstand, but it was just local New York. Once every day he’d have a different group of kids from various schools and let them dance to their music. Sometimes you’d cut out of school. The kids arranging all of this told him about our group and put us on the show. It was the first time he had a live group on the show. From that performance, I got a call from someone associated with Atlas Records wanting me, not the group. They were looking for another Frankie Avalon. I talked to the group and explained and at first I, didn’t want to do it. I didn’t want to leave the group. The guys in group said, “Vic, are you crazy? This is a big shot for you. Go ahead and do it.” The Parakeets were from Newark, New Jersey and already had two records out. They were supposed to be my back-up group. 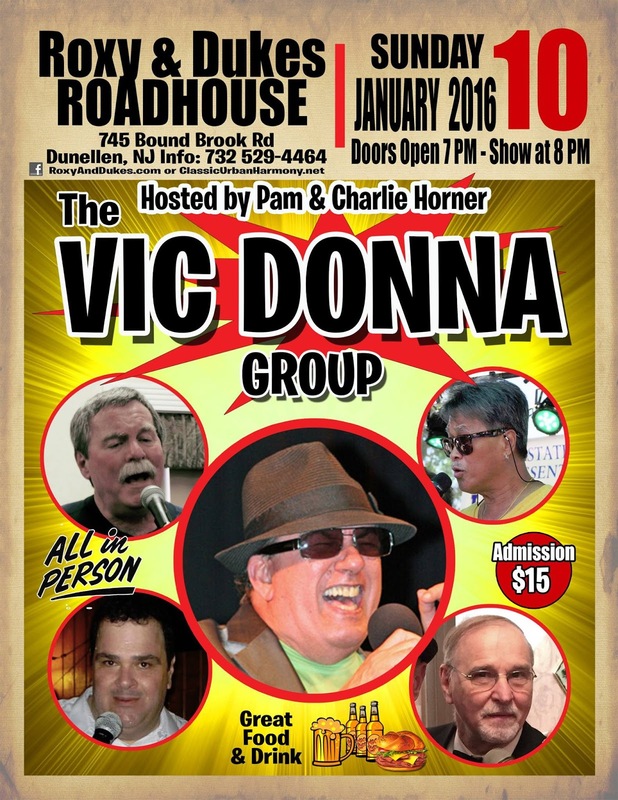 The record should say, “with Vic Donna, backed by the Parakeets”. Instead, it said Vic Donna and the Parakeets. When it started being played on the air, that’s how the DJs attributed and when the gigs started coming in – that’s what they wanted. B.K: Who were some of the other doo-wop groups in your neighborhood? V.D: Cirino and the Bowties – they were in the early Allan Freed rock & roll movies and he toured them. Teddy Randazzo and the Three Chuckles – The Caribbeans and a lot of other groups who never made records, just on the corner. I put out a CD in 2009 by myself. I didn’t have a group then and did all the voices myself. Hanging around with record collectors I’ve learned one thing. They have heard everything that has been made during the '50s and are constantly looking for things they’ve never heard before. I said to them I have a lot of songs we sang on the street corners that never made it to the studio – stuff by the Parakeets and the Fi-Tones. So, I put them on an album and put it out there and made my money back, plus some. I didn’t even know how to market it. I just put them in a couple oldie record stores. When I got the Vic Donna group together we did an album too. We didn’t lose or make money.